With the significant increases in people getting tattoos, the incidence of people wanting their tattoo removed or modified has also increased. Here’s what you should know before you fade a tattoo for a cover up or modification. The first thing to consider with tattoo removal, fading or modification is the safety of the laser tattoo removal machine being used. Q-switched laser machines are the most successful at removing all tattoo colours in the safest possible way. Q-switched machines cost about $150,000 and IPL lasers (Intense Pulised Light) often used for hair removal, only cost between $10,000 to $15,000. IPL lasers are the leading cause of both tattoo removal injury and unsuccessful tattoo removal. IPL laser machines are marketed as an all-purpose machine, including tattoo removal, but given the superior technology that Q-switched lasers provide, IPL lasers in our opinion, should not be used for tattoo removal at all. Read our in-depth but easy-to-read article about the Truth About Laser Tattoo Removal Machines. If you’re thinking of tattoo fading, modification or removal then you need to educate yourself on the best and most reliable laser tattoo removal technology. Tattoo removal techniques have come a long way since the days of skin removal (ouch!) and other non-medical lasers. Best practice in tattoo removal dictates that unwanted tattoos should be gradually broken apart through the use of Q-switched lasers set to specific wavelengths. Imagine if you were 10 pin bowling, but instead of bowling from the front, you bowl from the side and your goal is to wipe out one row of pins at a time, starting with the front pins only. This is similar to the first tattoo removal session. Tattoo ink is deposited in layers within the dermis of the skin. Lighter shading of tattoos means less layers, less ink and is faster to remove. In some cases, the shaded part of a tattoo can be removed in one session, like the front row of bowling pins. Generally, the darker the ink, the deeper the ink has penetrated into the layers of your skin, and therefore more sessions are required to achieve the desired result. So using our bowling analogy, we want to knock out the first and second rows of bowling pins only, and so less treatments are required to fade a tattoo. Do Different Tattoo Colours Fade Differently? The other consideration apart from shading is the number of different colours in the tattoo. Here is where the q-switched machines set themselves above from the rest of the machines on the market. Our machine brand at renude laser clinic is not only the first in the world to implement homogenous beam (even dispersion of heat making it much safer), it also has 3 wavelengths. High school science told us that colours are different wavelengths. If you have a multi-coloured tattoo, you need a laser that has multiple wavelengths to target all colours. For in depth but easy-to-read information about the laser tattoo removal technology, read our article The Truth About Laser Tattoo Removal Machines. How many treatments you’ll need to fade, modify or remove a tattoo varies according to how well your immune system clears the pigment after the laser treatments, the location of the tattoo, the size of the tattoo and colour of the tattoo, as well as your skin type. The body’s healing response can be too exaggerated if a large area is attempted to be removed or faded all at once. 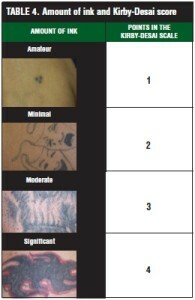 So again, best practice dictates that we treat large tattoos as part of a 2 phased treatment protocol. Tattoo Removal Gets Technical – 6 factors that we measure! 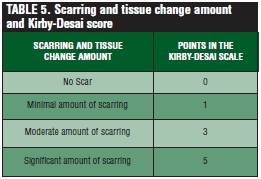 The Kirby-Desai Tattoo Removal Scale is a point-scale system designed for clinicians to determine with reasonable accuracy, how many removal sessions are required to achieve the desired results taking into account 6 key factors: tattoo colours, location, skin type, depth of ink, how the skin reacts to laser and whether there are multiple tattoos in the one location. This is all about the degree of melanin in the skin. 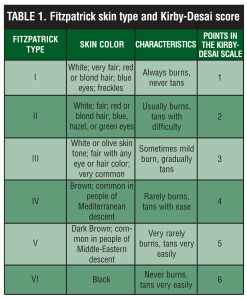 The darker the skin type, the more melanin. We have to use lower laser settings and wait longer between treatments in the darker skin types to minimize unwanted side effects of hypopigmentation or loss of skin colour. 2. Location of the tattoo. Remember we said that one of the most important factors of tattoo removal is the health of the lymphatic system? Ink particles are moved out of the body by the lymphatics and as it is a system of valves (requiring muscle movement, alas why exercise is important), the further the way from the heart, the harder it is to move. Generally, therefore, ankles can be the hardest area to move. This is why renude laser clinic have incorporated an entirely different laser to open the lymph channels. This particular laser is used on lymphoedema patients to decrease their swelling. We are the only clinic in Australia who is performing this technique. 3. The number and type of colours in the tattoo. Colours most often used by tattoo artists are black, red, blue, green, yellow, and orange. 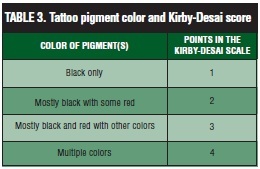 The size of the pigment particle for each of the different tattoo ink colours varies and as well as the ingredients in the ink itself which lead to the differences in amount of treatments needed. Black pigments are the easiest to remove due to their small pigment size, lack of metallic ingredients in the ink, and ability to absorb every wavelength of light. Red pigments are also considered easily removable in comparison to other colours. 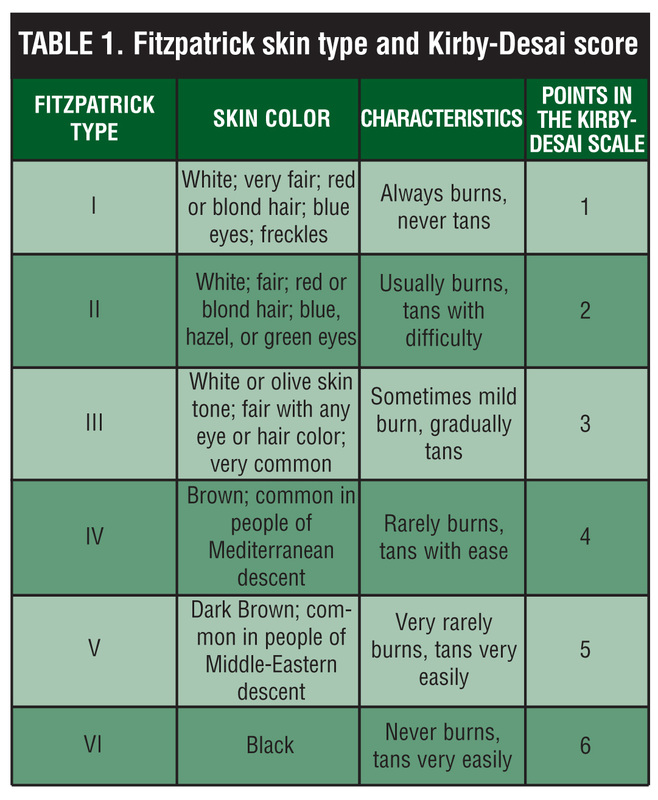 Colours, such as green, yellow, and orange are more difficult to remove and warrant a higher amount of points on the Kirby-Desai scale. White is probably the hardest colour to remove. This is where Q-switched lasers show their superiority in being able to target different colours with the appropriate wavelengths. 4. How deep is your (tattoo) love? Recall our bowling pin analogy? Amateur tattoos tend to lie quite shallow in the layers of the skin, like shading or letters, words or small symbols. Professional tattoos are deeper and therefore require more sessions for removal. In the Kirby-Desai scale, amount of ink is divided into four categories: amateur (letters, words, or small symbols), minimal (one colour, simple design), moderate (one colour, complex design), and significant (multicoloured, complex design). 5. How does your skin react and how sensitive is it? 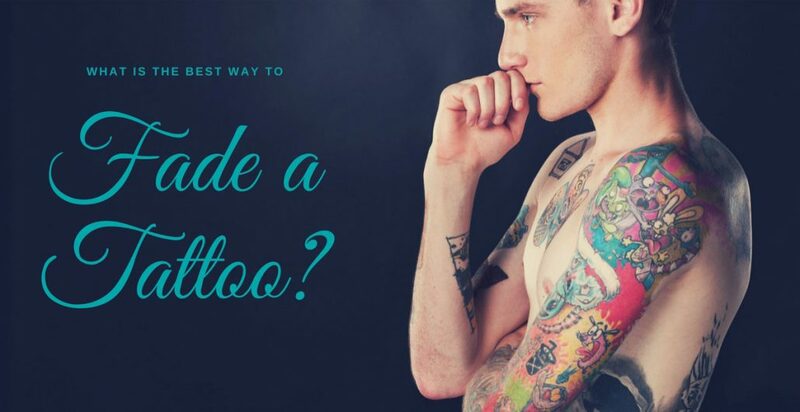 Tattoos can sometimes lead to complications that include the granulation of tissue, skin rashes, or excessive growth of scar tissue known as keloids and even psoriasis. Although the likelihood of forming scars is highly variable among people in general, some people with certain skin types have a higher propensity for the formation of scars. This will mean more treatments are required and unfortunately, an increase in the score. If you know you are prone to skin reactions but are looking at getting more tattoos please call our clinic on 0452 LaserU and schedule a course of treatment using our special healing laser which is likely to give you a better outcome. Our Low Level Laser Therapy (LLLT) will soften the scar tissue and enabling improved results. LLLT is also used in our pre-treatment protocols if you have existing scarring and want your tattoo removed. 6. How many tattoos are there – really…? When one tattoo is placed over on another it is called layering. This inevitably means that more ink has been deposited into the skin, so the score increases. Only the top layer of pigment can be treated at any one time. Think about rows and rows of bowling pins to knock over in our bowling analogy from above, one row at a time. Due to the many variations, this scoring system is considered about 80% accurate but it does give laser tattoo removal practitioners some way of estimating the number of treatments required to fade, modify or remove your tattoos. You Deserve to be Treated by the Best! Renude Laser Tattoo Removal have significant experience in the health and wellness industry and draw on the vast knowledge of the Director, Dr Catherine MacInnes. No other tattoo removal clinic in Australia offers the same level of pre and post treatment care to help your immune system remove the shattered tattoo ink particles and increase the healing response of your body to achieve faster tattoo clearance times. If you have any questions about your tattoos, feel free to call us on 0452 527 378 or book a complimentary consultation online at your convenience. Renude Laser Tattoo Removal Clinic for faster, safer, healthier tattoo removal. ReLove the Skin You’re In. Remove Your (tattoo) Ink Well – Tropical Swamp Water Smoothie Do Tattoo Removal Creams Work?